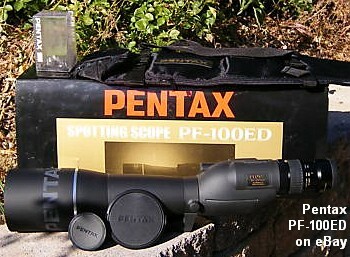 The Pentax PF-100ED is one of the best spotting scopes you can buy. It has a huge 100mm front objective, and high-quality ED (low-dispersion) glass for reduced chromatic aberration. The big Pentax accepts all American standard 1.25″ eyepieces, and the Pentax long-eye-relief eyepieces are excellent. The PF-100ED received rave reviews in our Spotting Scope Comparison test a while back, and it’s the scope that tester D. Reever chose for himself. Right now there’s an “as-new” PF-100ED on eBay, item 120268278337, with a starting price of $899.00 and no reserve. It includes a 20-60X Pentax zoom eyepiece. $899.00 may sound pricey, but this unit, BODY ONLY with NO EYEPIECE, now retails for $1599.00 at leading vendors (Adorama, Amazon, B&H). With zoom eyepiece, new PF-100EDs cost $1800-$1900. If you can grab this Pentax for under $1200.00 it’s a steal. The auction ends in two days. If you’re looking for big serious spotting scope that can resolve bullet holes at 600 yards and beyond, the Pentax PF-100ED is up to the task. We hope one of our readers snags this unit with a bargain bid. Share the post "Big Pentax Spotter on eBay Cheap"
Iowa skies unleashed a deluge recently, so the Iowa 1K BR championship has been moved back two weeks. 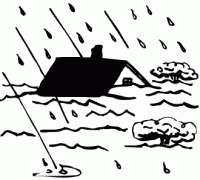 Gunsmith and match official Gordy Gritters reports: “I’m Letting everyone know our range is under water and there’s lots more rain in the forecast for this weekend, so we are postponing our June 7th, Iowa 1000-Yard State Championship match two weeks — until July. We are not going to shoot our State Championship rain date on June 21, but are going to do it on our next regularly scheduled match date- July 12. Share the post "Iowa 1000-Yard Championship Moved to July 12"